The restoration project on the meeting house has now started. Please pray for safety on site and for good progress. · Pray too for the services during this time, that the building works won’t hamper us too much. · We are using the “It’s Not What You Think” resources as the basis for three invitation services this term. Please pray that the folks we invite will come along, and that God will use what we share to ignite new faith. · Mark and Zoë take classes in the local Church of Ireland primary school most Tuesday mornings. Please pray that this Christian teaching will influence young lives for God. We would like to thank God that we received funding to re-surface the car park, erect new signage and drain our back field. We also need prayers for the successful completion of this work. Thank God that a lot of children and youths are coming to our Wednesday and Friday clubs. Please pray for the leaders and the children. We have been running a Community Parent and Toddler group on Tuesdays since January in our hall. Please pray for its continued success. Pray for the parents and children who attend, that they will find comfort and friendship in our group. We would like to thank God for our two new elders elected. Pray for their training and give them wisdom. Pray for all our Elders as they encourage and lead our church community. Give thanks for the grace of God given us in Christ Jesus and give thanks for answered prayer. Give thanks for the good attendances at Sunday worship, the Prayer meeting and Bible study group, and pray that the truth of The Word and the power of the Holy Spirit will draw people in repentance and faith to Jesus. Pray for the many people in congregations, known to God, who are suffering severe illness. Pray for Spiritual healing of body and soul as well as for physical healing. Pray for the work ongoing in Windsor Presbyterian. We have had a few amazing weeks with the culmination of the Alpha Course we did in conjunction with The International Meeting Point. The Alpha course finished up with three men committing their lives to Jesus and with a number of other participants having real encounters with God and are now very close to accepting Him. The men are very different in background and story, with one being just newly arrived in the UK, one having lived here for a number of years, and the other being born and bred within a stone’s throw of the Lisburn Road, and another is a young Romanian man. These men with very different circumstances are a source of celebration but also concern as we now seek to disciple, protect and equip these new brothers in Christ. · Prayer is requested for the New Leaf team as it conducts door-to-door evangelism on Saturdays. · Praise God with us for the continued New Leaf initiative meeting on Thursday at 6.30pm, with food, worship, Word and witness. · Prayer is requested for our Summer Scheme Programme at Seaview Presbyterian Church and for team members from PCI. · Please pray for conversations throughout the North Belfast area. · Pray and give thanks for the weekly coffee shop each Tuesday morning from 10.00am – 12.00noon, and for the staff who volunteer. · Pray for the community garden in Blackmountain Housing Estate; that the Kingdom of God will be planted in the hearts of all involved. · Pray for all of the staff in Farset International Hotel, and for Eddie’s continuing work there. · Pray for the Tuesday night house/Bible Study group in Highfield Housing Estate and for Eddie as he leads it. · Pray for Eddie’s new men’s group, ‘Male’ (Men at a Loose End) © eddiespencemusic, the continuing work around art. · Pray for the children who attend Millennium Court Children’s Club. · Pray for those who attend Ossory Park Outreach Bible Study. · Pray for new Christianity Explored Course on Friday nights at Kilkenny Presbyterian Church. · Pray for the ongoing door-to-door visitation. Pray for the ordination and installation of Lachlan Webster at 7.30pm on Friday 25 April in Craigavon Presbyterian Church. His first Sunday will then be 27 April. Pray for Lachlan and the congregation of Craigavon. 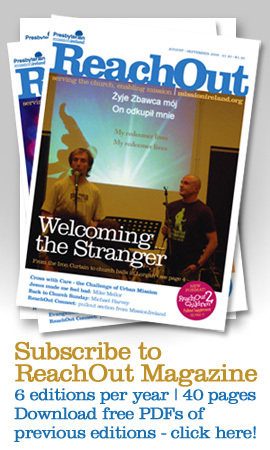 Looking for a magazine that will encourage, help inspire, you with stories of Mission in Ireland as well as equip you to live the Christian life? Subscribe to ReachOut a bi-monthly publication .